Tennakoon was on his way to office when four men on motorcycles blocked their path and attacked them. The suspect had been in remand custody following his arrest on August 15, this year in connection with the killing of The Sunday Leader editor Lasantha Wickrematunga on the morning of January 8, 2009. 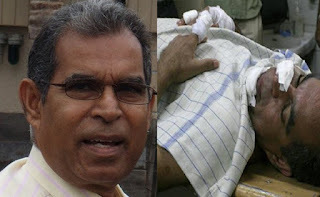 Gampaha Additional Magistrate Lalith Kannagara remanded the suspect till August 29 in connection with the assault case. Tennakoon, formerly the editor of Divaina and Mrs Tennakoon, who fled the country after the attempt on their lives, returned to the country in view of the case. Army headquarters recently conducted two separate investigations into the alleged disappearance of various documents sought by the Criminal Investigations Department (CID) probing the disappearance of media personality Prageeth Ekneligoda on the eve of January 26, 2010 presidential polls and the killing of Wickrematunga. Earlier Udalagama was identified at an identification parade as the kidnapper of Wickrematunga’s driver, Dias. The abduction had taken place a few months after Wickrematunga’s assassination.